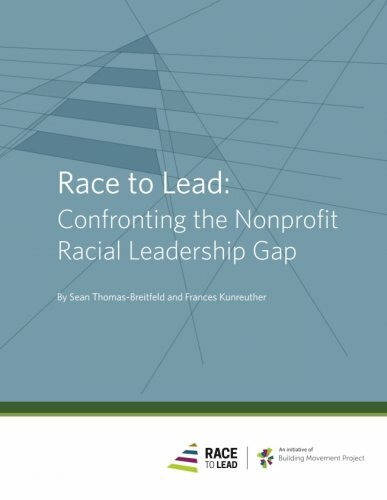 To find out more about this racial leadership gap, they conducted the Nonprofits, Leadership, and Race survey. Over 4,000 respondents answered questions about their current nonprofit job, interest in leading a nonprofit, training/supports, views of leadership, and personal background. Individuals were also asked about their views on race and the nonprofit sector. Demographic information included a question asking if the respondent identified as white or a person of color. This report, the first in a series to be released over the next two years, will compare people of color and white respondents’ background, aspirations to be leaders, training, and attitudes towards leadership. Over a decade ago, concern over generational shifts in nonprofit leadership began to surface. Studies warned of a looming crisis, anticipating too few new leaders with the experience and interest to take on these roles. Reports on younger leaders—both current and aspiring—began to surface issues related to race and executive leadership, part of a growing awareness of the need to address issues of race and race equity in nonprofit staffing and leadership. New programs were developed that focused on leadership training especially targeting a diverse pool as the sector’s future leaders. Yet the rhetoric on diversity in leadership has not matched the numbers. Programs and education on leadership and race have not resulted in more leaders of color in the executive director/CEO role. The Daring to Lead reports from 2006 and 2011 focus on nonprofit leadership; both reports found 82% of the executives who answered the survey identified as white. BoardSource’s 2015 Leading with Intent reported that 89% of the CEOs identified as white. In other words, survey results consistently indicate less than 20% of executive directors/CEOs of nonprofits are people of color. And this number has not budged for over a decade.